To create the dynamic table using the much recommended methods in RTTS, refer this document. The method mentioned below is now obsolete and is not preferred anymore. To learn about field symbols and data references, continue reading. Creating a dynamic table is not a big deal. Once you understand the concept, it is as simple as 1-2-3. So if your picture about dynamic internal table is something complicated, you need to change that mindset first before proceeding to learn about it. Dynamic internal table is an internal table with variable rows and columns which can be defined during run time. The different attributes that can be defined at run time includes the field name, column attributes, data type, width, reference table and reference fields. There are just three main steps involved in it. And then you have your dynamic internal table just like any other internal table. Before we start to create a dynamic internal table, we must have an idea of field symbols and data references. If you know them, skip this session and go directly to dynamic table creation. Field symbols are like pointers in C. (Technically, they are not the same, using this analogy just to get the picture). They just point to fields. They are like place holders or pseudonyms or alias for other fields. It is like two containers that are connected with a pipe. As long as the field symbol is assigned to the object, whatever you put in the field symbol, it will flow to the data object. And whatever is in the data object can be accessed through the field symbol. Any changes you make in <fs1> will be instantly reflected in the data object f.
Now variable f will have the value 10. It can point to any object determined at run time. And for the same reason, it can adopt to any data type or size at run time depending on the object it is pointing to. Data references are used to create data objects dynamically. DATA <dref> TYPE REF TO DATA. CREATE DATA <dref> TYPE <type>|LIKE <obj>. To access the contents of the data object to which a data reference is pointing, you must deference it. This is where we need field symbols. Now whatever statements are performed on Field symbols, it will be reflected in the object dref that we created at run time. Accessing field symbol <Fs> is equivalent to accessing data reference object dref. Ok. So now we are all set to create dynamic table. Let’s take an example to learn the concept. Suppose I have an internal table IT_DEMO containing three columns – vendor name (vend), Month(month), Amount Due(amt). I need to create something like a transpose for this table dynamically. The output should look like this. Step 1 – Create Structure. We create structure using field catalog. If you have used ALV, you must be familiar with field catalog and its fields. 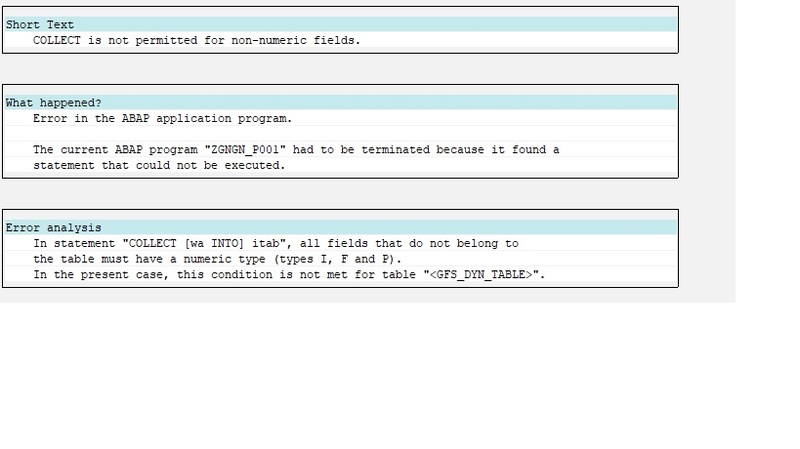 Some of the components of field catalog structure is field name, table name, column text, output length. These are the attributes that can be defined for each field of the dynamic internal table we are creating. Declare a structure of type lvc_s_fcat. Declare an internal table of type lvc_t_fcat (The line type of this internal table is lvc_s_fcat). ** This would create structure Vendor Jan13 Feb13 Mar13 …. DATA : gv_pos TYPE i. DATA : fname TYPE string. gv_pos = gv_pos + 1.
gw_dyn_fcat-key = ‘X’. “ Key attribute is set for the field vend. LOOP AT it_zdemo INTO wa_zdemo. CONCATENATE wa_zdemo-month ’13’ INTO fname. read table gt_dyn_fcat into gw_dyn_fcat with key fieldname = wa_zdemo-month. Now gt_dyn_fcat contains the structure of the table. Step 2 – Create Dynamic Table. Dynamic internal tables can be created using method CREATE_DYNAMIC_TABLE in class CL_ALV_TABLE_CREATE. Importing parameter is the field catalog created in step 1 and the exporting parameter is the dynamic table. The dynamic table must have been declared as dynamic data using data reference. * Create a dynamic internal table with this structure. Now we have the dynamic table gt_dyn_table. To access the data, we use field symbols. We shall create two work areas gw_line and gw_line1 like line of gt_dyn_table. (or like line of <gfs_dyn_table> which is the field-symbol assigned to gt_dyn_table). The work area gw_line will be accessed by field-symbol <gfs_line> and gw_line1 will be accessed by field symbol <gfs_line1>. CREATE DATA gw_line LIKE LINE OF <gfs_dyn_table>. CREATE DATA gw_line1 LIKE LINE OF <gfs_dyn_table>. Note : Field symbols were declared previously with the following statement. Each cell in the dynamic table is accessed using field symbols. We use the field symbol <fs1> to point to each component of work area <gfs_line> (alias gw_line). The values are moved to the work area, component by component through this field symbol <fs1>. * Avoid duplicate entries for key field VEND. READ TABLE <gfs_dyn_table> INTO <gfs_line1> WITH KEY (‘VEND’) = wa_zdemo-vend. ASSIGN COMPONENT ‘VEND’ OF STRUCTURE <gfs_line> TO <fs1>. * Move the amount for that vendor for each month in the dynamic table. Each month in the dynamic table can be looped using the field catalog table. LOOP AT gt_dyn_fcat INTO gw_dyn_fcat. READ TABLE it_zdemo WITH KEY vend = wa_zdemo-vend month = gw_dyn_fcat-fieldname INTO wa_zdemo1. ASSIGN COMPONENT gw_dyn_fcat-fieldname OF STRUCTURE <gfs_line> TO <fs1>. * Append the dynamic work area to the dynamic table. Now the dynamic table has been created and has been populated with the values based on the contents of the initial internal table. Programs with many dynamic internal tables are less readable. Performance is not as good as static internal table. Given below is the complete code for the above program. TYPES : END OF gfirst_typ. DATA : it_zdemo TYPE TABLE OF gfirst_typ. wa_zdemo1 LIKE LINE OF it_zdemo. * Populate the initial input table. Usually this input table contents will be populated at run time, which raises the requirement of dynamic table. The table contents are filled here for illustration purpose. Write : / ‘Initial Internal Table’. write : (12) ‘Month’ . write : (3) ‘Amt’ . WRITE :/ wa_zdemo-vend, wa_zdemo-month, wa_zdemo-amt. ** This would create structure Vendor Jan13 Feb13 Mar13 etc …. ** Create a dynamic internal table with this structure. * Avoid duplicate entries for key field PART. Write : / ‘Dynamic Internal Table’. LOOP AT <gfs_dyn_table> INTO <gfs_line>. Just a minor addition to the above program. Now if you want to display this as an ALV grid, you need to create another field catalog. Since the field catalog created above is not compatible with the field catalog passed as parameter for ALV display. Well explained and illustrated. I enjoyed reading it. But I believe dynamic table creation and manipulation is more structured when you apply RTTS classes ( cl_abap_*descr) instead of cl_alv_table_create=>create_dynamic_table. CREATE DATA me->o_status_table TYPE HANDLE o_table. Thanks for the explanation. I’ve never had to create a dynamic table yet so I’ll be sure to refer here when I do. I have two things to add, though. First, field symbols are not like pointers in C since you can’t actually see the address they hold. Field-symbols are more like permanently dereferenced pointers. Data references are actual pointers. And I believe after the 1st method call in step 2, you wrote gt_dyn_fcat a few times where you wanted to write gt_dyn_table. Overall the wording was very easy to read. Thanks for sharing! Yes, you are right in that pointers are different from C when you go to the technicalities like the address they hold. Just used that analogy to get the picture of field-symbols of pointing to another variable, and the closest I could get was pointers. Hence used it. I have added your suggestion to avoid any confusion. Thank you. Thanks also for pointing out the slip in table name . I have corrected the same. Instead of using the method create_dynamic_table of class cl_alv_table_create, you should consider using the Runtime Type Services (RTTS). 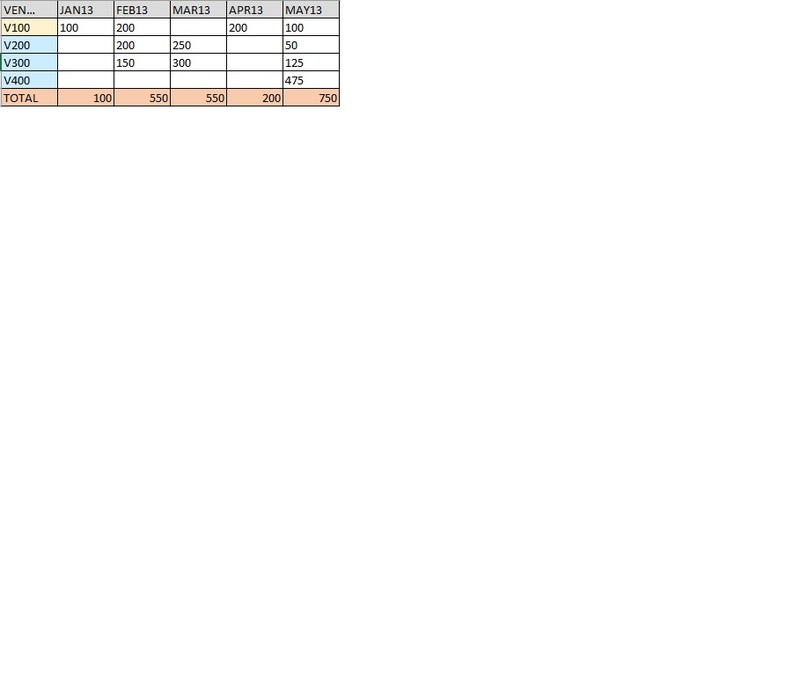 One of the example is: Create Dynamic Internal Table using RTTS. There are few advantages of using the RTTS over method call create_dynamic_table. Internally cl_alv_table_create=>create_dynamic_table, generates a subroutine pool with the provided fields, creates a subroutine to pass back the data reference and calls the subroutine to get the data reference back from the generated program to calling program. Whereas RTTS uses mixture of SYSTEM-CALL and KERNEL methods to generate the TYPES. So, they are definitly faster. Wow, so many comments for RTTS. It should be really good! 🙂 Read your document. Interesting. RTTS is a relativiely new concept for me. Will definitely explore it. Thanks Nimesh and Yuva Raj for the suggestions. RTTS doesn’t have the restriction on the number of tables you can have dynamically. But still the old solution is promoted. We had the need to create tables and structures dynamics, we used the method cl_alv_table_create => create_dynamic_table. However, the volume of dynamics information created in the same program was too big … and the exception occurred, i do not remember but I believe the limit is 49 runs. Then we changed to the method cl_abap_tabledescr => create to create tables and cl_abap_structdescr => create to create structures dynamically. Good explanation Had a requirement similar to this some time back. Was able to solve with help of Sandra Rossi and Marcin Pciak. ( https://scn.sap.com/thread/1969335 ). and other classes of RTTC/RTTS was of great help. Thank you for explanation. Very good . Just add that field to the structure. 1. For the structure of table : When creating the structure, you first add vendor column, then enter the loop to create columns for the months and after the loop, just add one more column for total. 2. To populate the total value – While populating other fields, keep a track on the total also. At the end, for each vendor, add the total also to that row. data : total type i.
total = wa_zdemo1-amt + total. ASSIGN COMPONENT ‘TOTAL’ of STRUCTURE <gfs_line> to <fs1>. I have used this code in my report but i am facing some issue that do_sum is not working and i have to show total and sub total for all respective coloumns in ALV grid. And finally for the ALV field catalog, this should also be moved to that field catalog. Thank you very much Susmitha… I would like to mention some point here that you had given statment gw_dyn_fcat-inttype = ‘I’. to make sum of figures but i wanted to make sum of figures with type p so i used gw_dyn_fcat-inttype = ‘CURR‘. and it works. It may help you and others. Thank you once again for instant reply.. I have an internal tabel in place of 5 coloumns and have created an alv list for it. But the requirement is that a a new coloumn addidtion facility must be availaible , since E , F , etc any number of cloumns might be needed i near future, add hence total mentioned below must be displayed accordingly . A B C D are present in one table . Could you explain your requirement again? It is not clear to me.. There are 5 columns already in a report . but the req is that there should be a parameter on the selection screen to add the coloumns dyanamicaly. So that whenever user wants to add the coloumn he can add it . The scenario is that : for CC company code 1111 there s count of 2 A’s 3 B’s and so on. Thanks for your Post. It is very useful to me for doing my development. I need some more requirement in my development . My requirement is to add one more row after the end of total, I have done doing calculation in final structure itself but i dono how to display the same after the row total at bottom. Please Suggest your input for this issue. Hi Susmitha, thanks a lot for this dynamic post. It helped me a lot. I have used the do_sum option for showing zeros in the output table where no value exist for that particular date, but i want to hide the summation row at the end of table. Could you please suggest a possible to hide the last row of the output table. I hope to hear a positive solution soon. Thanku so much for this valuable post. I have same requirement. i have created successfully dynamic internal table according to your process. now my requirement is to move all data from dynamic internal table to my internal table.so that i can loop and i can do some operation on that values. how it possible please get me back. This question has been covered frequently. Why not search the site for an answer? i am unable to find same. I guess Matthew will post lmgtfy url. Well, a kind of meta-lmgtfy. 🙂 You really do teach a man how to fish. Use “Modify” statement instead i does both jobs. I am having same requirement. Like Raw Material I have to display in column w.r.t FG. And this one very useful to me for understand dynamic report creation. Super, this is want i was looking for. This is an awesome illustration perfect to the current development i am doing…but i face an issue.. The row totals do not appear for me. But my output appears without the total. Any thoughts as where am i wrong? In the field catalog for the dynamic table, set the inttype to I to get the sum. You will get the totals. * You could also use ‘P’ – gw_dyn_fcat-inttype = ‘P’. If you want to give ‘CURR’, you must pass reference field and reference table also in the field catalog. For the field catalog for ALV display. Thanks a ton for such a nice explanation. I have one more requirement in addition to the stated requirement i.e. I have three fixed columns before the Month columns viz. and have to sum up amounts in months row wise and Purchs. Docu or Vendor wise depending on which one is not blank. Very well written and explained. Thanks a lot Susmitha for sharing your knowledge. It helps me a lot in one of my requirement. Thank you very much for posting such a nice useful document. Thank you, it help me a lot. whould you explain, how to change code if i change your data like this? cause in feb we have 2 order with different date. Dear Susmitha, your wiki was indeed quite helpful. I had a request from business to get partner fields from quality notifications available on QM11 standard report and the instructions provided helped our development team out to achieve a great end result. Thank you! This is great. thank you for your post it help me so much. Since my company want a report in this format. I have develop a report where the column is dynamic. Good work, Thanks for explained steps. Could you please explain it more ? Hi, Susmitha. Thanks for this post is very usefull for explained steps. Thank you for that amazing explanation. If you do not want to use CL_ALV_TABLE_CREATE. DATA lr_table TYPE REF TO data. DATA lr_structdescr TYPE REF TO cl_abap_structdescr. lr_structdescr ?= cl_abap_typedescr=>describe_by_data_ref( ref #( ls_structure ) ). DATA lr_tabledescr TYPE REF TO cl_abap_tabledescr. lr_tabledescr ?= cl_abap_tabledescr=>create( p_line_type = lr_structdescr ). CREATE DATA lr_table TYPE HANDLE lr_tabledescr.